Have you ever found yourself working on a new laptop and constantly hitting the wrong key by mistake? Perhaps the Ctrl key has another key next to it, or maybe the Backspace key is too narrow. 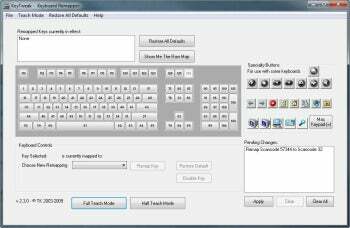 KeyTweak is a free utility that lets you remap almost any key on your keyboard so that hitting it would produce a different keystroke (the "right one"). KeyTweak shows the current keyboard layout using numeric scancodes. Unlike popular scripting/remapping tool AutoHotkey, KeyTweak does not need to be running in the background to work. It remaps keys by changing Windows registry values, which then remain active system-wide, even if you uninstall KeyTweak. This means that for KeyTweak to work in Windows Vista and above, you must run it with elevated permissions. More important (and annoying, sometimes) it means that you must reboot your computer to see your changes take effect, and that any changes apply for all users of your computer. KeyTweak features limited support for special keys, such as multimedia keys, and the author doesn't guarantee support for all special keys. When testing it, I kept trying to remap my keyboard's Browser button so that it would send a simple keystroke. Having to reboot my system after every change made testing difficult, but after two reboots I realized it just doesn't work with that key. Instead, I decided to test KeyTweak by remapping my numeric pad's Del key to send "1." This worked just fine, and did not affect the "regular" Del key (the one next to Insert, Home and End). Remapping keys can also be useful when working with alternative keyboard layouts. I use the Colemak layout, so many of the keys on my hardware QWERTY keyboard actually send different keystrokes. While you could use KeyTweak to get the same effect, there are easier ways to install an alternative keyboard layout, such as Colemak's own installer, or the Portable Keyboard Layout utility (which is based on AutoHotkey, a great way to remap keys in itself). I see KeyTweak as a useful tool mainly for remapping individual keys and resolving small keyboard annoyances, or maybe for replacing broken laptop keys when you're on the go and can't send the laptop in for repair. If there are just one or two keys on your keyboard that are driving you crazy, KeyTweak is the tool for you. Put your keys in their proper places with this remapping utility.